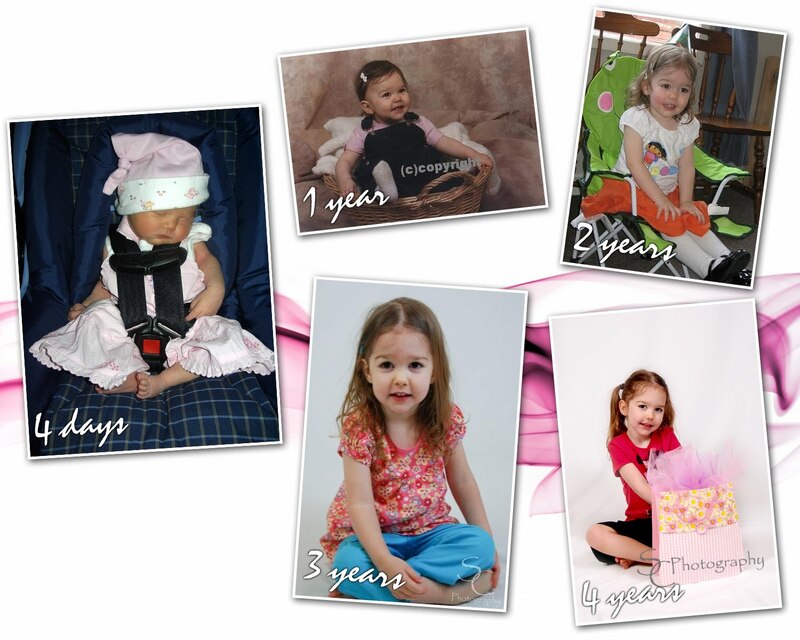 My "baby" Turns 4 Today! 4 Years ago today my life changed big time. Linda Lee was born at 10:31PM Friday, April 7th, 2006. 8lbs 5oz 23 inches long. I went in Friday to be induced because of high blood pressure. After 12 hours of strong contractions and nothing happening I needed a c-section. I was scared, but was excited to meet my new baby. At that time we didn’t know if the baby was going to be a boy or a girl. I thought I was going to have a boy but after the baby was taken out and the doctors yelled “it’s a girl! !” I said at once, “our Linda Lee”. Linda Lee was going to be my first girls name since 1997 when my mentor, friend, second mom died of cancer. She meant so much to me and I wanted to share her life with my first daughter. My husband didn’t have a choice, lol. They brought Linda over to me and the first three thoughts were, “whoa do babies have that much hair?” “Are babies usually that big?” And “I love her.” I had to wait the longest 2 hours of my life to finally get to hold her. While in recover I kept trying and trying to move my toes. The nurse told me I couldn’t leave until I could move my toes. The first time I held Linda without anyone in the room I sang to her two songs, “Great is Thy faithfulness” and “I Love you Lord”. I then prayed over her. I couldn’t believe God let me have her. We had wanted kids for so long and we were finally blessed. Linda was an easy baby. By the time she was 2 months old she was sleeping through the night and taking 2- 2 hour naps during the day. She is always a good sleeper. Linda was a good eater too, she had no problem taking mommy milk. She showed signs everyday that she was advanced, she was doing things a baby her age normally couldn’t do and was growing like a weed. Linda was wearing 12 month clothing by 6 month. I love spending every minute I can with Linda. She has grown up to be an amazing child. Very funny, loves to learn, loves to sing, loves to dance. Linda is even an awesome big sister as you can read in my blog from a few weeks ago. Linda will have her first dance recital in June too. Sigh, growing up too fast. I love you so much Linda. You are such a joy to be around, you make life easy, you make me smile & laugh. I love all the hugs and kisses you give me daily. Don’t lose your fire, your passion, your love for life. I’m proud to be your mommy. Thank you for letting me be your mommy.